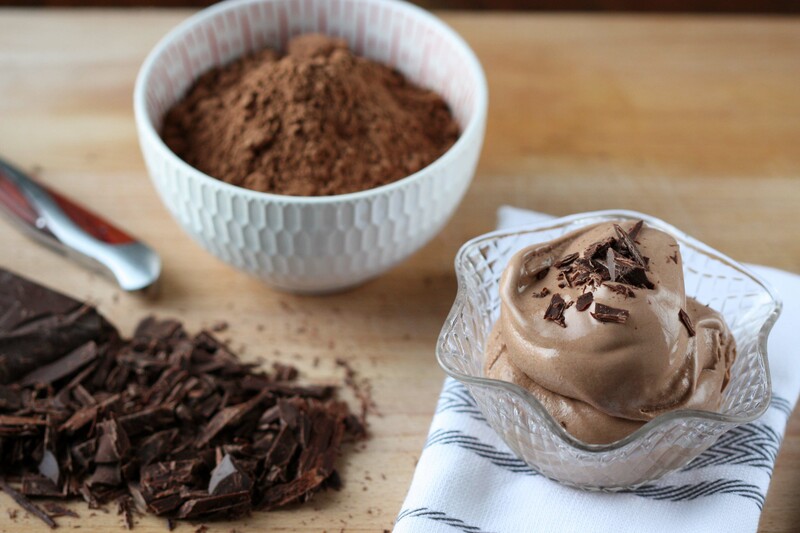 People always ask me which is my favorite gelato, I tell them that I like a lot of different gelato flavors, which is true, but it is also true that in the early morning hours, when I’m still at work perfecting recipes, the chocolate gelato its the one I find myself digging into the most. How can you really beat a great chocolate gelato? Here is a simple way to make your own version, which I promise will be better than any store-bough one. Mix all the powders together in a bowl: sugar, cocoa, dextrose and the stabilizers (be careful with the stabilizers, only a few grams are necessary and it is hard to weigh them on a regular scale, one that measure the fraction of a gram would be preferable. Anyway, if in doubt, less is better than more). Place the milk and cream in a saucepan, put on medium heat and bring to a near boil (if you let it boil the milk and cream will lose flavor and water). .
Pour the hot milk and cream over the powders and mix with a hand whisk at first and then switch to the immersion blender, blend away for about 5 minutes, this will payoff in the end by making your gelato even creamier and smoother. Put everything back in the saucepan and on the stove at medium heat, keep mixing with the immersion blender until you reach 185˚ F, keep checking with the thermometer, once at this temperature lower the heat and try to maintain the temperature for two minutes while still mixing with the blender. Transfer the mixture to a bowl, cover it carefully with film wrap and put it in the refrigerator for 6 hours (or until it reaches 42˚ F if you are in a hurry, it can easily stay there for 24 hours though). You must cover it carefully because it could pick up undesirable aromas from your refrigerator. Once the batch has cooled, mix it with the immersion blender for a few minutes before putting it in the ice cream maker. Ideally you would serve it immediately after it has spent ten minutes in the freezer, because it is at its most creamy and delectable then. If you wait longer than about 30 minutes, it will become hard. In this case, it’s best to place the container in the refrigerator for about 5-10 minutes to let soften gently. The gelato will be delicate and is best served in frozen bowls. I like to serve it with flakes of semi-sweet chocolate as this adds another texture and flavor. Whipped cream is also nice with this gelato, because it offers the palate a respite from the intensity.